The two Democrats vying for their party's U.S. Senate nomination spent the first minutes of Sunday's debate at the Klein Memorial Auditorium in Bridgeport discussing last weekend's shooting deaths in that city. U.S. Rep. Chris Murphy, the endorsed candidate, is being challenged in an Aug. 14 primary by former Secretary of the State Susan Bysiewicz. Introducing himself to the audience and viewers who can watch a tape of the debate on Cablevision, Murphy noted it was a strange week for such a faceoff, sympathizing with victims of the massacre in Colorado at the premiere of the latest Batman film and also of recent violence in Bridgeport. Keijahnae "Nu Nu" Robinson, 15, was pronounced dead at Bridgeport Hospital on Saturday evening, less than a day after gunmen sprayed the Brooks Street porch she was on with bullets, striking her in the head and wounding two of her friends. Only two hours before that shooting, Mi Lin Zhao, the 30-year-old owner of the New Hong Kong Chinese Restaurant on Wood Avenue, was killed while fending off armed robbers on his way home. The first debate question focused on high unemployment, while the second pivoted to whether the candidates support additional gun control legislation. Again Bridgeport's violent weekend was mentioned. "I absolutely think we need tougher gun control laws in our country. We've seen states that have tough gun control laws have fewer deaths," Bysiewicz said. "Right here in Bridgeport, just in the past 48 hours there have been two deaths and using illegally obtained guns." Those homicides remain under investigation and it was unknown whether illegal firearms were used. Murphy said he has spent his career in the state General Assembly and in Congress supporting "sensible gun control legislation." He again referred to the Colorado movie killings and the Bridgeport shootings. "What psychology leads to someone leaving a sweet 16 birthday party and spraying bullets across a front porch, as what happened in Bridgeport this weekend?" he said. Mayor Bill Finch, a Murphy supporter, greeted Murphy following the debate. Finch said he was not present for most of the event, including the comments about the shootings in his city. "Violence is something that's affecting every American city," Finch said. "We need members of the Senate to stand up to the National Rifle Association ... Murph and I have done the best we can to control guns." 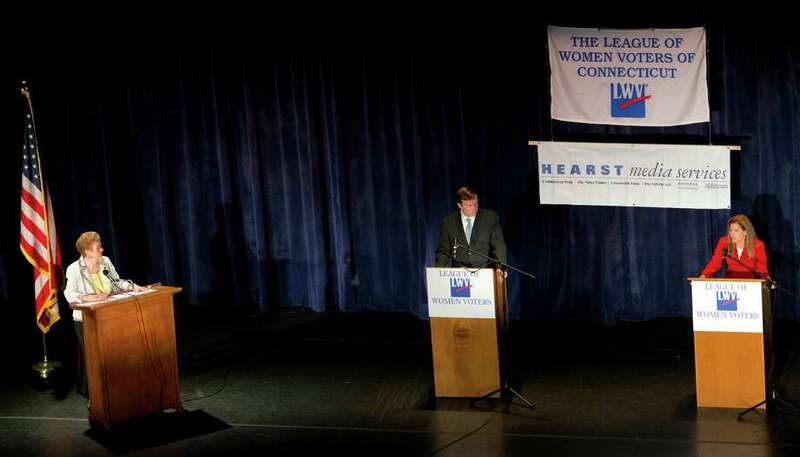 Sunday's debate was cosponsored by the League of Women Voters of Connecticut, Hearst Media Services and Cablevision. Murphy and Bysiewicz continued to argue over financial-services contributions to the former's campaign and which candidate would be tougher on Wall Street excesses. Murphy referred to his support of the Dodd/Frank financial reforms, calling them "a good start." "But we need to go further," he said. But Bysiewicz said, "Dodd/Frank was weak and terribly watered down by the special interests." For months, she has accused Murphy of being bought by Wall Street contributions, despite the fact he is supported by numerous liberal and good-government groups that are no fans of big banks and financial services firms. "Susan's been using this tired attack line for about a year and a half, and no one's buying it," Murphy said. And when Bysiewicz later said her major priority if elected would be to hold Wall Street accountable, Murphy shot back, "Boy, if you're going to elect a U.S. senator whose priority isn't jobs, isn't putting people back to work, then you've elected the wrong senator." Bysiewicz responded that her Wall Street plan would also create jobs. Bysiewicz hit Murphy's donations from Wall Street in a television advertisement released last week. But the spot has caused her some controversy because the campaign acknowledged it used and misrepresented some four-year-old data. After Sunday's debate, Bysiewicz told reporters she will not stop airing the ad, even though she acknowledged it contained an inaccuracy. "Chris Murphy has taken $700,000 from Wall Street," she said. "I'll take down the ad if Chris goes ahead and gives back his $700,000 to Wall Street." Murphy afterward told reporters his campaign has asked television stations to stop airing the advertisement. "They have a Federal Communications Commission obligation to pull an ad the campaign has said is fictional," Murphy said. "It's made up."